My dollhouse was probably one of my favorite things to play with when I was a kid. Luckily for me, my parents have held on to it over the years and while it is a little torn down - Lucille has already gotten to play with it a bit at my parents house. 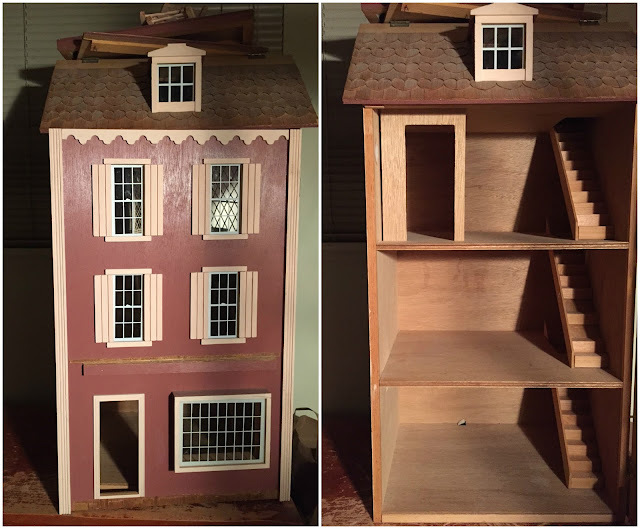 Seeing some of the amazing things that people are doing with old dollhouses - I've decided that this is a project I am going to take on for Lucille's birthday this year. I've started by just making a list of the things I currently have that need to be fixed or that I want to do. Also going through all the furniture, people and other things I had in boxes and pulling out the items that are actually the right size and in decent shape. Stay tuned and follow my project dollhouse journey - I'll be posting here as I do some of the projects. If you're interested - some of the amazing people that have provided me inspiration are @adollhouseforedie @mostlyminiature @minihome_co and @lindsaysdollhouse. So much great stuff!